This little guy has done a ton of damage this year. Small, quick, and secretive, there are not many of these on a plant but there damage is very noticeable. 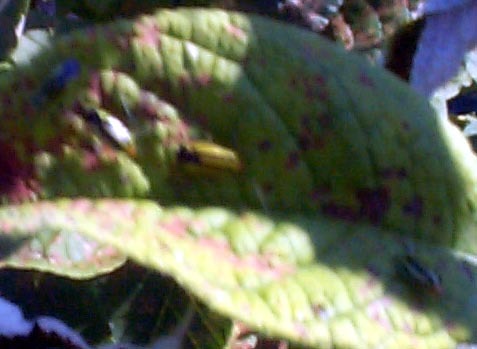 The picture above is not very clear but shows three bugs on a buddleia leaf. It is unusual to see that many together on a leaf. They love new growth of a wide range of plants- basil, mints, forsythia, buddleia, caryopteris, and so on. The leaves are spotted by small(>1/8") brown areas, usually many close together.1/3" long with a green body with brown stripes, this bug drops or flies off quickly when disturbed. If you are quick, hand pick the few on the plant or try a pyrethrum spray or other insecticide. The damage they do to the plant is unsightly but does not harm the plant in the long run.